In the world of the WWE, many people pick their favorites, and whenever those favorites seem to have other wrestlers as their enemy, the enmity is automatically transferred to the fans. The same thing happens in almost all the other sports activities on planet earth. It is not unusual to see a couple fighting because one supports Chelsea Football Club while the other is an Arsenal fan. However, apart from these, the WWE Network has a set of champions that seem to have the rage of the people upon them more than the others have. Both in the wwe ring and backstage, they seem to have something in them that attracts the disdain of the WWE fans and other WWE workers. So below, we are making a list of the 5 most hated champions. Kane is one of the WWE champions the fans and staff wanted to have in their hearts as one of the most legitimate in the business. Even when he was unmasked in 2003, many WWE fans still saw him as something real, and were willing to love him. But his feud with Chris Benoit, the later arrival of young stars like Rey Mysterio, John Morrison, and CM Punk did to the WWE not help matters. When his feud with The Undertaker was brought back to the ring, many WWE fans got tired of both of them, and the hatred that followed was of monumental proportion. The list of WWE champions that faced so much hate will never be complete without this name. He was a 13th time WWE champion that had so many enemies both in the ring and off the ring. His wife is the daughter of Vince McMahon, and some people think he is favored in WWE fights because of that. He was also accused of treating the Punk like a slave, after booking himself to beat him in 2011 in the bid to demoralize him. This turned many against WWE fans him. This is another WWE name that should not be missing here because we are talking about certainty and not about free slots uk. Many people love him now, especially after he was declared one of the best WWE wrestlers ever. However, when he held sway at the WWE, he was a pure mess. He was addicted to drugs and was a prima donna too. Communication with him was very difficult then, and he never agrees to lose to anybody in the WWE. He was also hated because of the feud between him and the loved undertaker. A lot of people in the WWE industry harbor deep seated hatred for Hulk Hogan. While some people respect him for what he has done for the cause, many still do not have him close to their hearts. He was one that never allowed any victory over him. People believed he had a huge ego and wants to be the name on the mouths of the fans all the time, so the hatred. His selfish attitude made him to refuse to lose to Shawn Michaels in 2005 and to Bret Hart in 1993. The wrestling world had enough hatred to go round, and the ultimate warrior also got his dose. He had an ego problem like the Hogan, and though he has been whitewashed after his death, he had people calling for his head all the time. He was a selfish prima donna, and saw no dignity in any other person. For people like Ted Dibiase, Bobby Heenan and Bret Hart, he is among the highest pricks you can encounter in the business. He had no talents, yet he succeeded. So, for vogueplay, people had nothing to admire him for. Though he wins matches, each match always almost seems like the others. He was also a right wing extremist. 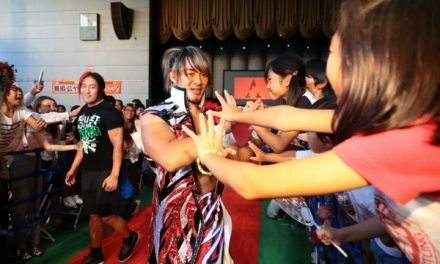 Eight Years in the Making: Kota Ibushi’s Other WrestleMania Weekend Plans?